In winter, the danger of ice formation in modern non-insulated cattle houses is present, especially in exterior walking areas like feeding alleys, non-roofed partial sections and open yards. 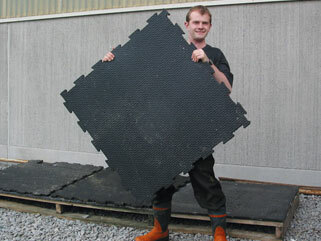 „A big advantage for our cold barn is, that the rubber mats allow a lower temperature inside the cubicle house. The concrete slatted floor was freezing very quickly. But with the rubber mats we hardly see an ice layer on top of the rubber mat in winter time because of the insulating effect of the rubber. 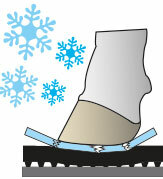 If it happens that some ice layer is on top of the rubber, e.g. during the night, the cow cracks the ice while walking on the elastic rubber."